Washington County Master Gardner Association formed an exciting new partnership with Portland Community College at Rock Creek (PCC-RC) as the site to develop a new ~1/3rd acre educational garden located across the street from Building 9. PCC Rock Creek Map. In November 2018, the garden installation of soils, plants, pathways, garden shed was completed with a few plants to be added in the spring. WCMGA offers a series of educational sessions at PCC Rock Creek as part of our In the Garden Series. See the In the Garden Series schedule here. The Rock Creek campus is also the location for the PCC Landscape Technology (LAT) Program offering opportunities for WCMGA to work with students, faculty and staff on projects ranging from design, to site preparation to irrigation, tree care, soils and more. The garden site is located off the main entry road providing high visibility and extended access during campus operating hours (Monday-Saturday 7:00 AM to 10:00 PM) Map to WCMGA Education Garden at PCC Rock Creek. As a former staging area for construction, the compacted soil offers challenges, but also offers opportunities. Many gardeners find that their garden site is less than ideal and need to take a hand in actively reshaping it to meet the needs of a garden. We reclaimed an area that prior to being a gravel lot was a field used for pasture and is now used to educate sustainable gardening practices. Seating areas nested in the garden and in open air covered pergola for outdoor classes. Drip and overhead irrigation illustrating impact of these two types of irrigation. Boulders, gravel and other natural elements adding to aesthetics. Re-purposed materials e.g. steel, urbanite, wood, and glass for attractive art installations. Trees throughout to develop into areas of shade. Learning stations informing visitors about a range of gardening topics including pollinators, insects, plant attributes and maintenance. Year-round interest plants and practices such as leaving seed heads on for wildlife. Create an attractive low water use, low maintenance landscape that provides habitat and incorporates a diversity of drought-tolerant and drought-resistant plants. Provide alternatives to landscaping with large expanses of turf (high water, fertilizer and maintenance needs). How to work with poor soil, how to deal with landscape-challenged areas such as “Hell-Strips”. 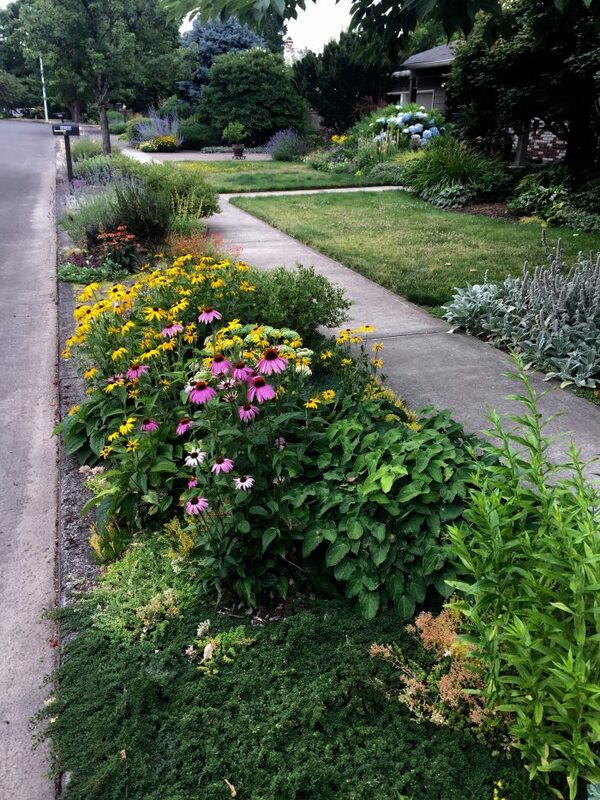 Use of berms and quarter-ten gravel to address drainage problems Incorporate native and non-native water-efficient trees, shrubs, perennials and ground covers to create plant communities and provide habitat for pollinators, birds and insects. Grouping like-needs plants in large overlapping drifts. 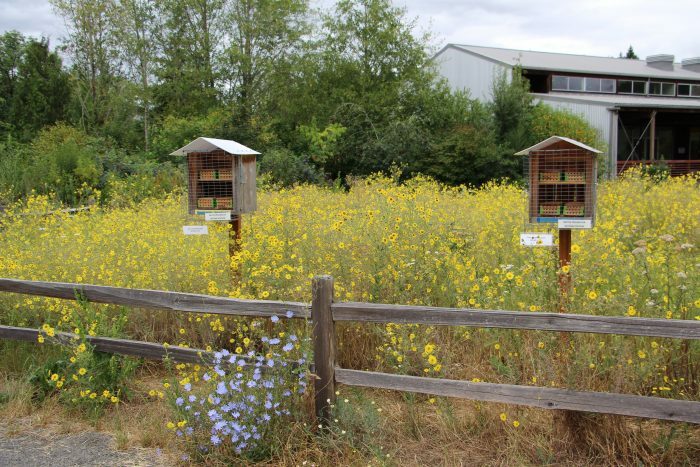 The garden contains a series of nesting stations designed to attract native bee pollinators. Each nesting station contains nesting trays specifically designed for several bee species. One station will be set up to allow the public to directly observe nesting activity. Educational materials about native bee pollinators will soon be available to the public at the nesting stations. Mason bees are the focus because of their proficiency as pollinators and because of the public’s general interest in these bees. The bees attracted to the nesting stations also provide ongoing pollination services to the garden throughout the growing season. Virtually all the native bees attracted to the nesting stations are solitary cavity nesting bees. These bees are very accepting of human activity near their nests and present no danger to the public. Several species of native bees will likely nest in the stations over time and will offer a wide variety of educational and observational opportunities for the public to enjoy. A series of classes on mason bees, their identification, behaviors, care and maintenance are being offered in 2019. 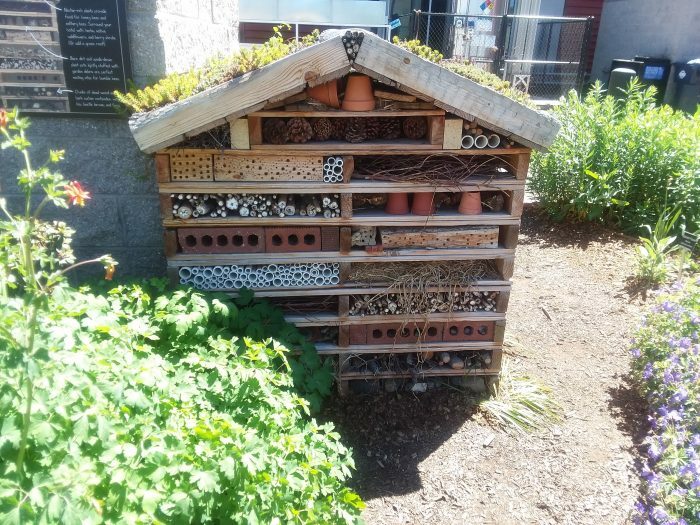 The focus of the Insect Habitat Garden Classroom is to raise public awareness about beneficial insects and their importance in the ecosystem. Information on alternatives to the use of pesticides and developing a tolerance for low levels of insect damage on plants. (Some birds identify their food source by spotting insect-created notches in leaves). Hands-on activities, handouts and signs to help identify beneficial insects found in home gardens and their role in the ecosystem. Classes on creating habitats to attract and keep beneficial insects. Habits can be as simple as stacking a pile of tree trimmings, providing an undisturbed bare patch of ground for ground-nesting bees or leaving some leaf litter under shrubs. 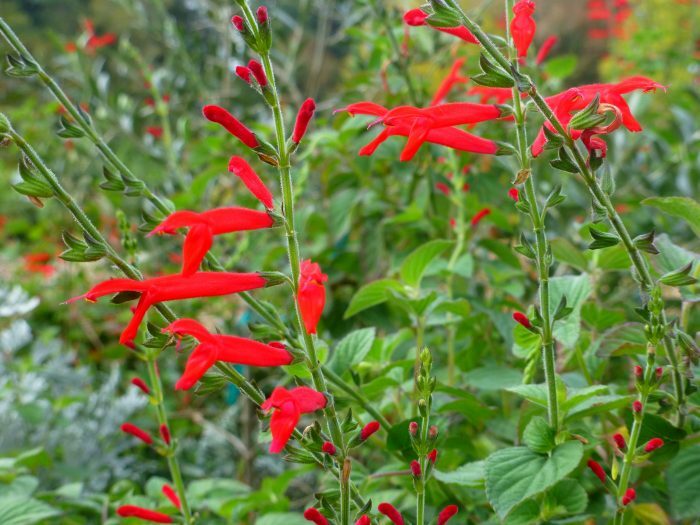 Plant lists for plants that provide a continuous food source throughout the growing season. Identifying plants that are adapted to our area that are also pest and disease resistant. Learning what plants beneficial insects prefer for their food and shelter. The many benefits of using native plants. Using the garden as an outdoor classroom for schools groups where students learn to identify and observe insects in a garden habitat. Act as a resource for updated information on new invasive insects in our region and what gardeners can do (signs, handouts when. Insect pollinated fruits and vegetables provide most of the vitamins and minerals we need, and they diversify our diet beyond meat and wind-pollinated grains. In the Pacific Northwest pollinator-dependent crops are a mainstay of the economy. Pollinators are also directly responsible for many beverages (juices), fibers (cotton, flax), oil crops (canola, sunflower). 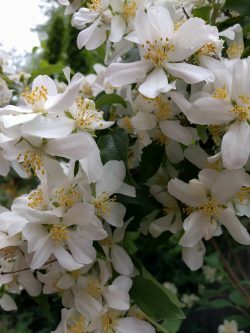 They also are responsible for providing the many beautiful flowering plants and trees which provide spiritual inspiration, better mental health, and improved learning. In short, insect-pollinated plants are the basis for our food, well-being, and our economic stability. Our pollinator garden demonstrates how to establish a variety of plants with overlapping blooming times to provide foraging throughout the seasons using a combination of both native and non-natives trees and shrubs Plants are chosen that require minimal care once established. Plantings are in flower groupings (clumps) of rounded blocks to minimize weeds and to localize the pollinator flight range. Adjacent gardens supply nearby habitat patches and provide nesting habitat. The garden features plant diversity using eight or more species, resemble natural native plant communities, bloom time succession from spring, summer and fall, native grasses, nonnative perennials and ornamentals, including common garden herbs. A fragrant plant stimulates our senses, lifts our mood, evokes memories, adding to the healing pleasure of nature. The Fragrance Garden offers a four-season palette of fragrant shrubs, vines, annuals and perennials. A local horticulture therapist helped us with plant selections to help support activities that reflect most of the seven universal characteristics of a therapeutic/healing garden. We see this corner of the larger garden as a welcome “escape” for stressed students and community visitors, a peaceful setting for reflection and learning and, of course, a fun sniffing adventure for kids of all ages!